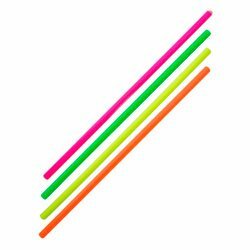 Devil Sticks and Flower Sticks | Buy Devilsticks & Flowersticks. 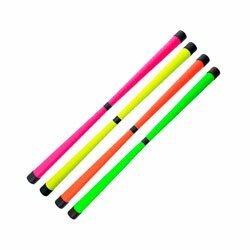 Devil sticks are short batons that are controlled with a pair of handsticks (generally sold separately). 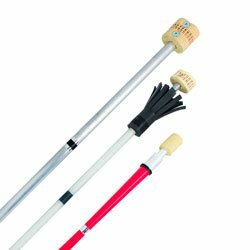 The central stick - the devilstick - is made to rotate and perform tricks with the hand sticks. Devilsticks tend to be made from tapered wood with either a shiny decoration or grip tape wrapped around them. The hand sticks are also commonly made from wood but they are covered with silicone to aid grip, making tricks a little easier. 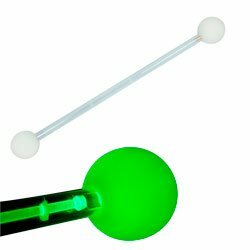 Devilsticks are a classic circus skill prop. They are entertaining for both adults and children as the basics are fairly easy to master but more advanced tricks will keep even the keenest player occupied for a lifetime. Flowersticks are very similar to devilsticks. The main difference is that they have tassels at either end. These tassles, or flowers, add momentum to the stick as well as slowing its rotation. Flower sticks are also covered in silicone. Both of these things make learning tricks with flowersticks easier than with a devilstick. This makes them great for children and beginners but it also means there is a larger range of tricks available to experienced players. We have devil sticks and flower sticks for kids, adults, beginners and advanced players for sale. We also have a range of handsticks, glow LED devil and flowersticks as well as fire versions.